You live in Markham, where the roads are almost as busy as you are. And yet, driving is still the best way to get around. So make things easy for yourself: apply for a car loan online, get approved in 48 hours or less (even with bad credit or no credit), and pick your car. Applying takes just a few minutes. Access to competitive auto loan rates in Markham. How do I qualify for a car loan in Markham? Easy. You just need to be 18 or older, fully licensed, and a Canadian resident. Lastly (but certainly not least), you need to be earning a minimum income of $1,500 per month at your job. What’s the biggest car loan I can get if I have bad credit? Our car loans usually start out around $5,000 and go all the way up to $40,000. The dealership you’re matched with will determine the size of the loan you can be approved for based on your income and credit. Can I use my car loan anywhere? No. You can only use your car loan to buy a vehicle from the dealership in Markham that we’ve matched you with. But don’t worry. No matter which dealer you’re paired up with, you should be able to find a vehicle that fits your budget and satisfies your car-buying checklist. I just moved to Markham from another country. Can I get an auto loan? Yes. We don’t require a Canadian credit history to approve you for a loan. Does your car loan service extend beyond Markham? What if I live somewhere else? Yes. Our dealer network operates throughout Toronto and all across the country. Wherever you live, we’ll help you get a car loan. Will you check my driving record before I get approved for a car loan? No. We don’t ask for your driving history and neither do the auto dealers in our network. Just make sure you’re fully licensed before you apply for an auto loan with us. And of course, drive safely. What affects the size of my car loan payments? Your car loan amount, interest rate, and term length all factor into your payment. Obviously, the bigger the loan and the higher the rate, the more expensive your monthly payment will be. But how does your car loan term impact your payments? Think of it this way: your car loan term (the length of your loan) determines how many individual payments your loan is divided into. 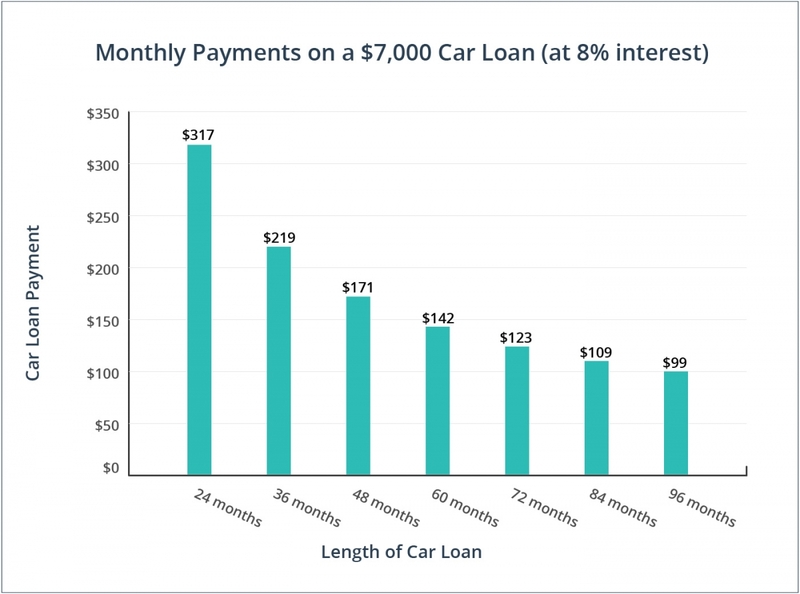 A long car loan term slices your loan into more payments, and the more times your loan is sliced, the smaller (or more affordable) each slice gets. And the opposite is true for a shorter loan term: fewer slices result in bigger payments. Check out our graph below to see how your monthly payments shrink as your car loan term gets longer. You just got approved for an auto loan, and that’s pretty exciting. But a loan doesn’t equal free money — you have to pay it back eventually. So opt for a smaller loan and keep your debt to a minimum. Yes, you need financing for your car, but that doesn’t mean you have to automatically agree on all the car loan conditions the dealer presents to you. Ask questions and negotiate the best deal you can. Markham roads are full of flashy rides (we’ve all seen the underground parking at the VIP Cineplex), but an expensive car requires a big car loan. Set realistic car-buying goals and find a vehicle that meets your needs rather than your wants. And then pick your car loan term wisely. Make sure your car will last at least as long as it takes to pay off your loan. For example, if you’re buying a car that you only plan on keeping for 3 years, pick a term of that same length or shorter. I’ll save money if I choose a long car loan term instead of a short car loan term. False. Long car loan terms are actually more expensive because you pay more interest. With a short car loan, you pay off your debt much faster and minimize the amount you’re charged on interest. Car loans are a high-risk product that can damage my credit. False. While you shouldn’t apply for one on a whim, getting a car loan won’t damage your credit. Not if you’re responsible, anyway. If you make your payments on time, car loans can actually improve your credit score. Leasing a car is the same as getting a car loan. False. Leasing is like renting a car long-term. You make ongoing payments, drive the car, and then return it when the lease is over. On the other hand, when you get a car loan, you’re borrowing enough money to cover the full purchase price of the vehicle. When your car loan term is over, your monthly payments stop and you own the car. I need an extensive credit history to qualify for a car loan. False. You don’t need any credit to get a car loan through our service. We understand that many car loan applicants are new to Canada and may not have had a chance to build up any credit history. That’s why we’ve made our car loan service as accessible as possible. Markham car buyers, rest easy. You’re protected by the provisions set out in the Motor Vehicle Dealers Act when you buy from a registered auto dealer in Ontario. Drivers can get charged up across Markham: 12 new e-vehicle charging stations, including two Level 3 chargers, are coming to town in 2016 and 2017. Auto dealerships aren’t hard to find in Markham. You’ll see at least 10 planted along Highway 7 and Kennedy Road. A National Household Survey found that 74% of Canadian commuters drive to work — which probably sounds a bit low if you’ve ever been stuck in Markham traffic.